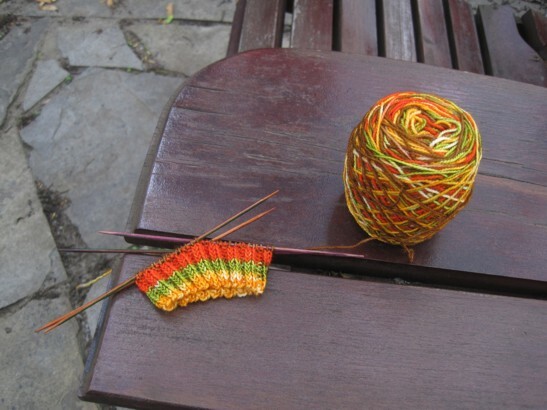 On top of the Vesper and not counting several other skeins I'm hoarding from Biscotte et Cie, I have lined up 12 pairs of socks to knit in just 6 months. Something will have to give, or I will have to get faster, or both - probably both. Anything but stop buying yarn! Since I have a long day out today where I will undoubtedly need to pick up and put down more super compact, straight 'no need to look down' knitting than I have on any other needles, I set up the snuggest of the twin cakes with a full ribbing so I can just pick up and go. 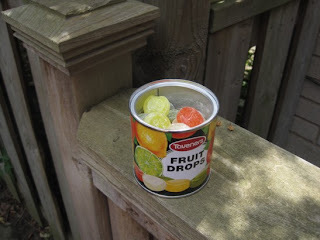 Mum used to keep a tin of Taveners Fruit Drops in the kitchen for treats when I was very small, and though they were just boiled sweets I was fascinated by the deep dredging of powdered sugar they were packed in to keep from sticking. It was very special to be allowed to have one, and even more so to be able to choose an orange one since I was not alone in disliking the more-abundant lemons and the limes. I found this tin in a little gift shop last week and had to have it. Timely, yes? Anyway, that's the code name for these socks - the Taveners, this time with all the saturated orange a girl could want. Wish me luck!